Platinum Cineplex is your ultimate international movie destination, bringing you a wide selection of exclusive and entertaining movies from around the world, taking you beyond Hollywood, Local and Domestic. Moreover it is fasten by 7.1-channel surround system has seven discrete, full-range channels of sound—Left, Right, Center, Left Surround, Right Surround, Left Back, and Right Back—plus a subwoofer that delivers high end quality sound only. English language movies shown in private viewing rooms at Movie Street Video Center, #116, Sihanouk blvd., The French Cultural Center (Street 184) hosts French films at 6:30PM every few days. The Russian Market (Toul Tom Pong) carries the most recent movies CDs. Phnom Penh, Siem Reap and Sihanoukville is the place for disco nightlife. There are many clubs that see a good mix of locals and foreigners, like Rock, Spark, LV… Nightlife in Phnom Penh and Siem Reap tends to begin fairly late – an 9 pm start is usual, after a leisurely meal and some drinks at a bar. Drink prices can be steep, but you can always pop outside and get a swift half from a street seller. Outside Phnom Penh, Siem Reap and Sihanoukville, nightlife is dominated by Khmer nightclubs. These are basically ‘hostess clubs’ aimed at men, but it is no problem for foreign women to enter. They have a live band and are a good place to learn a bit about Khmer dancing. ublic performances of Khmer traditional dance are few and far between. 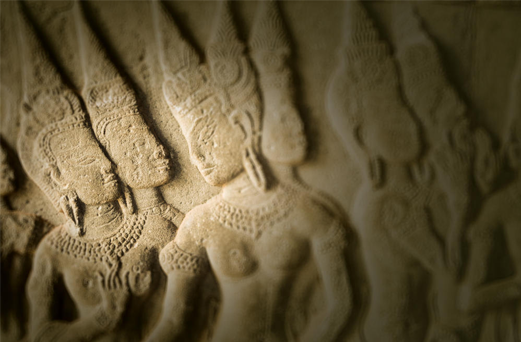 The places to find are at Cambodian Living Art, few hotel in Phnom Penh and most local restaurants and some hotels in Siem Reap like Angkor Village Theatre, Kulen II Restaurant, Angkor Century Hotel, Mekong Restaurant, Mondial Restaurant… Check the local English-language newspapers for news of upcoming events. Phnom Penh, Siem Reap and Sihanoukville are best place for pubs and bars. You can find easily, the popular pub and bars are located along the Sisovath Quay (Along Riverside), Pub Street near Old Market area in Siem Reap and Ocheuteal Beach in Sihanoukville. Elsewhere around Cambodia, drinking takes places at street stalls, in restaurants and in nightclubs.